Dr. Alan Vajda (CU Denver) and Dr. David Norris (CU Boulder) dissecting fish from Boulder Creek to evaluate effects of wastewater effluent exposure. Endocrine Disruptors and Drinking Water (starts at 3:12) Today we continue our series called The Ocean is Us, which explores our vital connection to the oceans. Alan Vajda, an environmental endocrinologist at the University of Colorado Denver, talks with How On Earth’s Susan Moran about a rare success story: why fish in Boulder Creek are acting and looking more sexually normal. We also explore broader water-quality issues in Colorado and beyond, and the implications for human health. 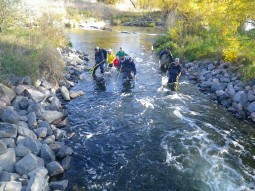 For more information on studies conducted by CU and USGS scientists on endocrine disruptors related to Boulder Creek, South Platte River and elsewhere, visit BASIN. Check our website for the previous interview in the “The Ocean is Us” series, on Teens4Oceans. And check out KGNU’s year-long series on Colorado water issues. It’s called Connecting the Drops. It’s at kgnu.org and yourwatercolorado.org. To learn more or become active in preserving our watershed and the oceans, go to Colorado Ocean Coalition. All features in The Ocean Is Us series can be found here.